If there’s one way to describe Kuala Lumpur, at least from my perspective, its extremes. My first experience of Kuala Lumpur was of flying low and coming in over green shrubs which I soon noticed were easily as tall as the people tending to them. This soon gave way to a bustling city that was in places either shabby, or extravagant. My hotel, naturally, was in the shabbier part. Not that this was a bad thing however, a little rough round the edges and big cracks in the pavement, but everything was clean enough and nothing that jumped out as alarming or dangerous. 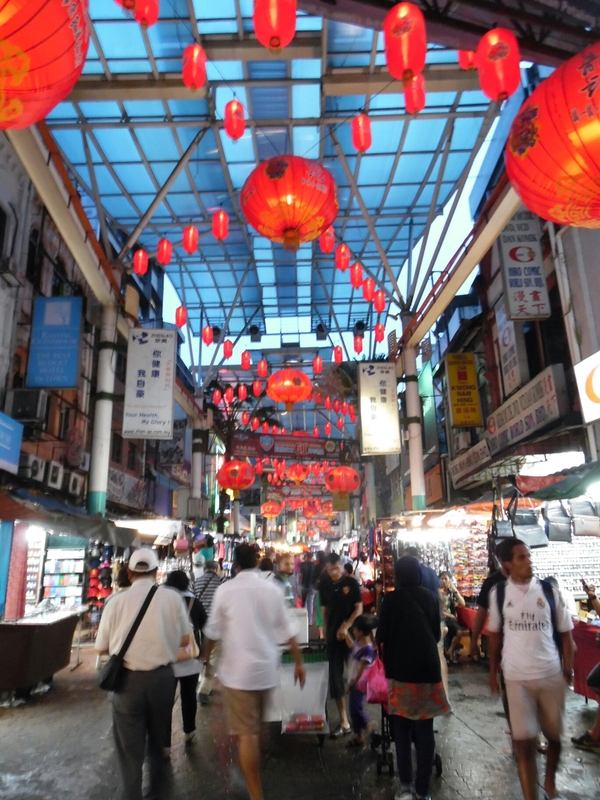 I got to my hotel when the market sellers were setting up their stalls in Petaling Street, the main market thoroughfare through Chinatown. But whilst everyone else was setting up for the morning, I had already been up for what had pretty much been a full day; it wasn’t much later than four am that morning back in Britain, but I didn’t actually seem that tired. Although I’d managed some rather light on and off dozing on the plane, it was most likely because you don’t really use that much energy sat in one place for nearly 13 hours. Either way, I eventually managed to figure out the rather unique payment on KL’s metro system that I needed to get me there (rather than single tickets they use plastic tokens that I can only compare to the fairground variety, although they do also have MyRapid, an Oystercard equivalent), and soon found the door I was looking for. In front of this door were three ladies who I have to admit were wearing quite possibly the brightest and shiniest dresses, and had the most dolled up faces I saw throughout my entire time in Kuala Lumpur. Needless to say they stood out from their surroundings (especially considering the time of day), and the few reviews I had read about the hotel also having rooms booked by the hour didn’t seem that far-fetched. It was the sign above that said “Alamanda Hotel” which assured me I had the right place, however. Much like on the outside it had everything that was needed to serve its purpose, but just wasn’t very glamorous (I’m talking about the general area again, not the ladies). My room had a double bed and a TV, but that was about it. There was just enough room on the floor for my backpack, and despite not having a window, the walls were decorated with a stylishly ornate picture, and several smears I couldn’t recognise. I did have my own bathroom however, although this had only enough space to stand and face one of two directions; either towards the sink with a mirror attached to the wall above it, or the toilet and shower that were arranged in much the same way. 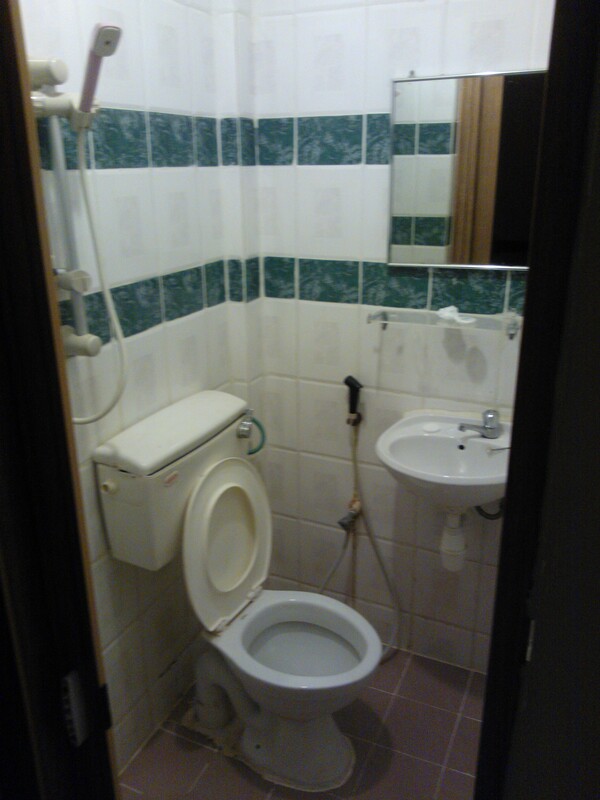 It also came furnished with what’s known as a hand bidet. Despite this being the subject of possibly the first conversation I ever had with a good friend from Indonesia, and essentially being in essentially a tiled wetroom, I have to say curiosity didn’t get the better of me. Finding myself in a strange new city however, and pleased with myself at having finally mastered the short Kelana Jaya LRT journey from KL Sentral to Pasar Seni station, literally just the next stop, I went out for a bit of an explore. I headed out on the monorail to Berjaya Times Square, a massive shopping mall to ease myself in gently, but one filled with small vendor stalls rather than the big international chains that would be found in the others. 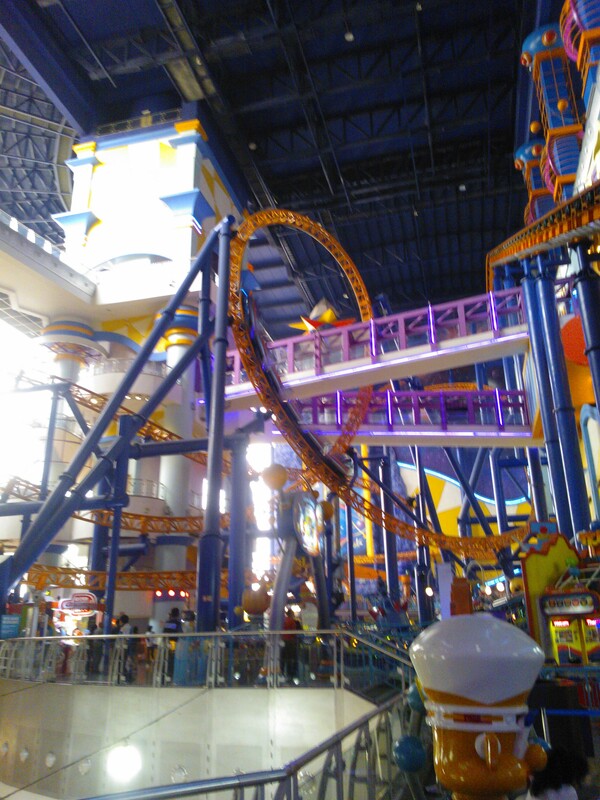 I also chose this particular mall as it had a small indoor theme park complete with roller coaster, although my need for speed was overcome by that for food, and I soon found a good compromise between Asian cuisine in a familiar style: the Chicken Rice Shop. Stifling a few yawns I made my way back to the hotel in full expectation of my head hitting the pillow and falling straight to sleep, although I kept myself busy until the (very) early evening so as to sleep through the night rather than wake up fully refreshed in the middle of it. Despite my planning however, this wasn’t to be the case, and I instead spent the night awake until half 6 the following morning, in what was probably the most delirious night of my life. Jet lag is quite possibly the strangest sensation I have experienced; a lack of sleep when I was expecting it to be over abundant, something made even worse by the fact that throughout the past days travelling I hadn’t actually felt that hungry (I only had my small lunch at the Chicken Rice Shop after realising how long it had been since I’d last eaten), and remembered that although two meals were served on the plane, over such a long journey it was as in short supply as a decent kip. Lying in bed spending several hours always expecting to fall to sleep but not quite managing it, I at least had Bill Bryson, wifi, and decent enough friends to put up with my ramblings on the other end of it to keep me company. By half 11 I ventured downstairs to see if the bar/fridge in an alcove area had anything to eat, and was served by the same man who earlier was at reception, and had to fix my room’s air con. He was also the same man who had pointed to his kicking foot saying “Ah, Rooney” when I told him I was from England. Their selection hardly rated any Michelin stars, but far too hungry to be picky, I figured that if there’s anywhere I can get away with scoffing down a pot noodle as a midnight feast, it’s in the middle of Asia. This at least kept me going until six, when I figured there would now be somewhere I could get something a little more substantial, and on advice from a friend, filled myself up on stodge from the corner shop I found less than 100 metres away. A corner shop which happened to be a 7-11, known to those in countries which have them, as being open 24 hours. Far too hungry and tired to be annoyed however, after a breakfast of muffins and cream buns, I was finally able to get some proper, actual sleep. Throughout that sleepless night though I was having visions of changing my next flight to an earlier one in order to escape, or even flying straight back to England, as I felt it was all too much for me. Luckily this was only symptoms of my brain being just as confused as my body, and I soon came to enjoy a place which only those not in their right mind I (trust me, I know!) could dislike or consider alien and unfriendly, and the three days I spent in this glorious city just weren’t enough.